Muffaletta Pizza with all the flavors of the famous New Orleans sandwich on a chewy, homemade pizza dough. 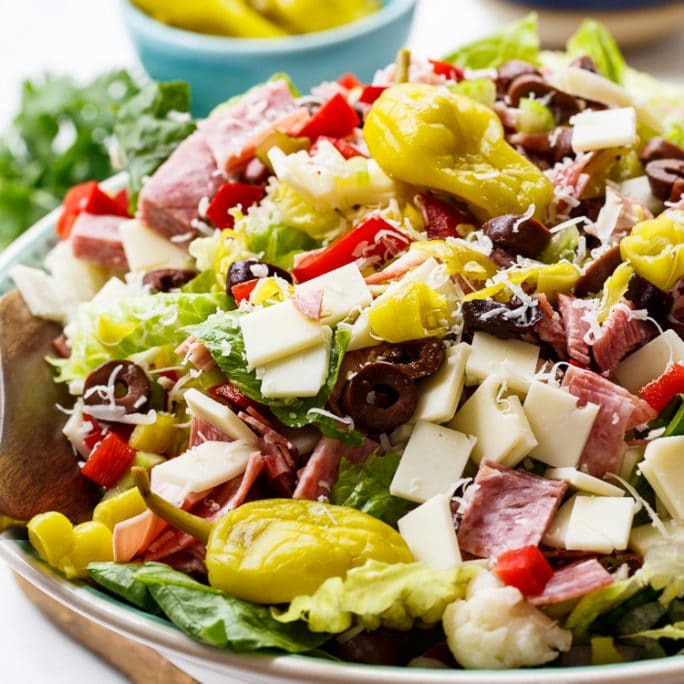 Lots of meat, lots of olives, some provolone, garlic, roasted red peppers, and chopped artichoke hearts. This is one easy and delicious pizza! There’s not really a sauce on this pizza but there is plenty of flavor from the olive mixture that gets spread on the dough. It includes olive oil, red wine vinegar, and garlic. Enough about what’s on the pizza. We have to talk about this pizza dough that I made. It was incredible. Before I made this dough I was convinced that I was the worst pizza dough maker in the world. Not only could I not make a satisfactory dough, I couldn’t even roll out a store bought dough with much success. I was certain that I would forever have to purchase pre-cooked pizza crusts. But my pizza dough making skills have increased 1,000%. I was so proud of the dough I made y’all. What changed? I watched this FREE Perfect Pizza at Home class taught be Peter Reinhart, author of the cookbook American Pie: My Search for the Perfect Pizza . I can not tell you how fabulous this class is. You will have to watch it for yourself and see. It will have you making pizza like a pro in no time. The whole class is about 37 minutes long, but you can choose which segments you want to watch. And all Craftsy classes have a 30 second replay button that will replay the previous 30 seconds. This is great if you are making the dough and watching the instruction at the same time and you missed something or fell a little behind. I haven’t included the recipe for Peter’s dough here because he gives a lot of instruction and I really couldn’t do it justice. Just go watch it- Perfect Pizza at Home . It’s completely free and once you download it you can watch it as many times as you want. In all you learn to make 4 kinds of dough. I have only made the American-style “Neopolitan” pizza dough. It turned out so springy and perfect, I kept wanting to touch it. He also shows you how to stretch (not roll out) your dough with the dough dangling off your thumbs. I struggled with this the first time and you can see this pizza has sort of an odd shape. But the next day I made a Thai-style pizza and that one turned out much more symmetrical. I can’t tell you how happy I am that I can finally rock pizza dough! 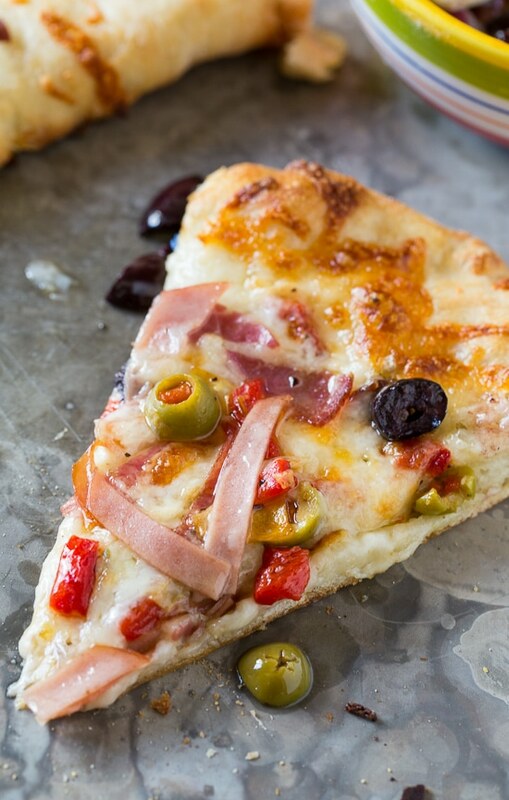 Muffaletta Pizza with all the flavors of the famous New Orleans sandwich on a chewy, homemade pizza dough. 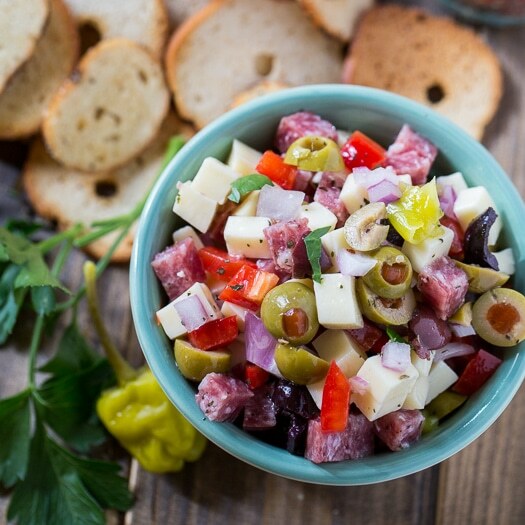 Lots of meat, lots of olives, some provolone, garlic, roasted red peppers, and chopped artichoke hearts. Mix all ingredients for olive salad. Refrigerate until needed. You will need to make your pizza dough a day in advance, refrigerate it and bring it to room temperature for 90 minutes. You will want a ball of dough that is about 8 ounces for each pizza. Preheat oven to 500 degrees or as hot as it will go with a pizza stone in the oven. Use your fingers to press the disk of dough out some and then let it rest for 5 minutes before proceeding. Either watch Peter Reinhart's method for stretching the dough in the Pizza making Craftsy class, or use a rolling pin. If it gets to where it doesn't want to stretch anymore, let it rest a few minutes. Spread about 1/4 cup of olive mixture on pizza dough, being sure to get as much of the liquid as possible. It will flavor the dough and take the place of a sauce. Sprinkle 1/2 cup shredded mozzarella on top. Scatter sliced provolone cheese and meat on top. Finish with about another 1/4 cup olive salad sprinkled on top. Use a paddle to transfer pizza to pizza stone and cook until cheese is melted and crust is brown, about 5 -10 minutes depending on how hot your oven is. Watch the free Craftsy class Perfect Pizza at Home for the dough recipe and tips on handling it. 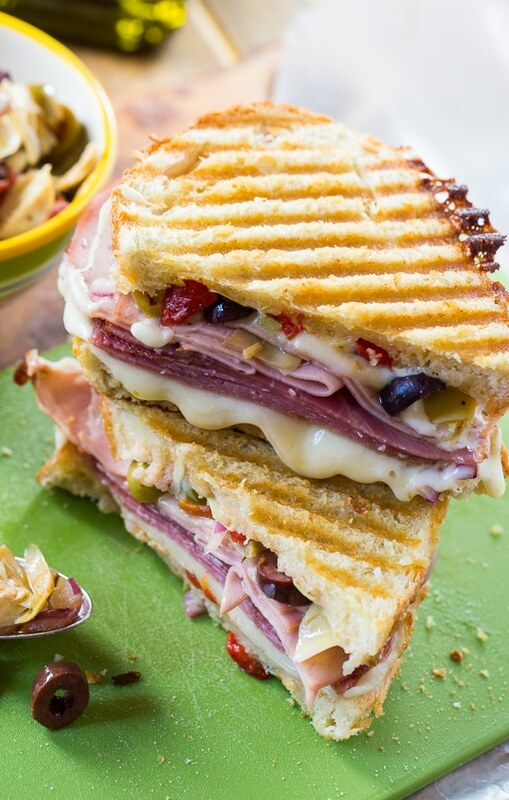 This entry was posted in Main Dishes and tagged craftsy, Mardi Gras, muffaletta, Pizza. Bookmark the permalink. I looked at some muffuletta sandwich recipes, but they were more work than I wanted to do right now and this seemed like a good substitution. It was easy and tasty. Thanks! So perfect for a Mardi Gras party! Muffaletta pizza is genius! That video definitely sounds like it’s worth watching because the dough/crust looks wonderful. That thai-style pizza sounds really good, too! The best part of making pizza at home is the wonderful combinations you can dream up. Yay for rocking the pizza dough! Will definitely have to watch the video because this pizza looks phenomenal! Love the New Orleans sandwich flavor in here! This pizza looks amazing, Christin! 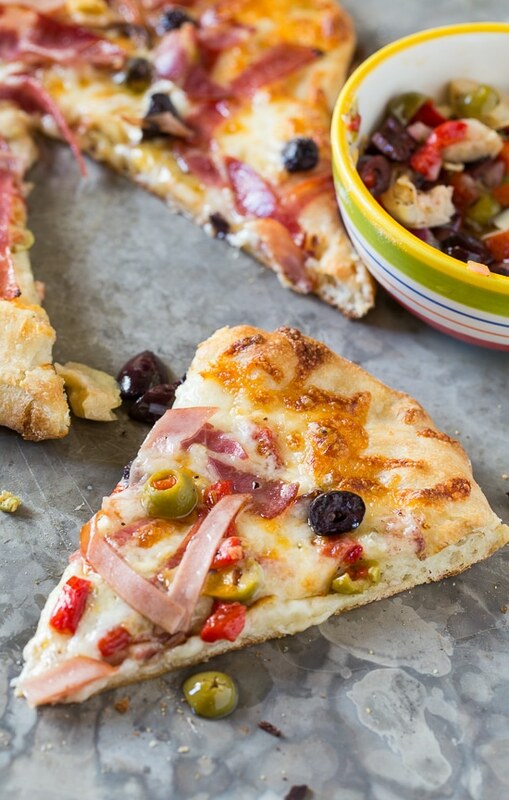 Muffalettas are one of my favorite sandwiches, so this pizza sounds so good! What a fun combination! 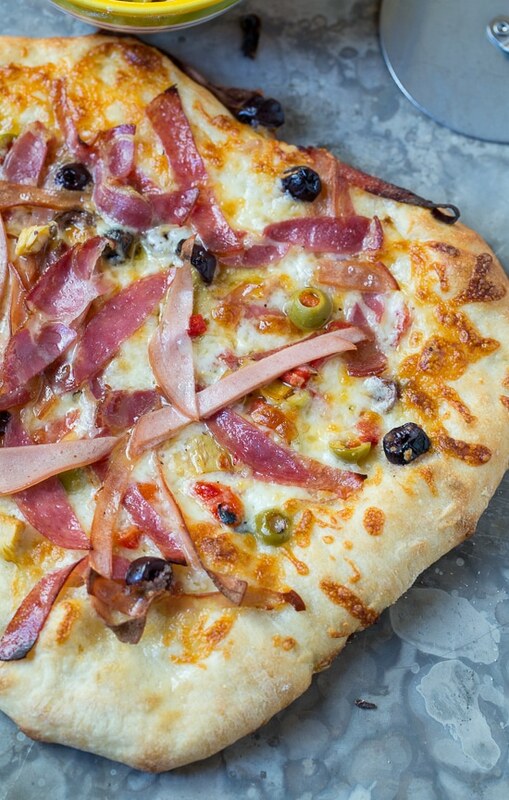 OMG… this pizza with all the flavors of the New Orleans sandwich is killing me!! This looks so delicious and also chewy!! Pinned!! 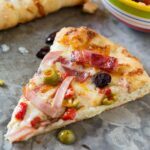 I am a pizza lover so I love seeing new recipes! Can’t wait to try this!